D on’t forget to renew your NC Real Estate license by June 30. The NC Real Estate Commission requires that you renew your license online at www.ncrec.gov. Friday at 919-875-3700. If you have a firm license, it too must be renewed by June 30. Also, all active brokers will need to renew your NC privilege license with the NC Department of Revenue. The privilege license tax is $50 each year. Step 1. 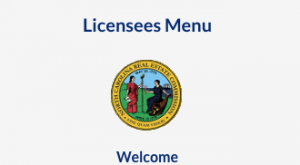 As a NC real estate licensee, you may login to the NC Real Estate Commission website to verify that the continuing education courses you completed prior to the June 10th deadline have posted to your account. Once you login, click “CE License Information” to see a complete historical transcript of your continuing education credits (NCREC approved courses). Since you can get continuing education from a number of different schools and school sponsors (private schools, community colleges, NAR, local Realtor associations, etc. ), I always recommend that licensees go directly to the NC Real Estate Commission website to periodically check their CE transcript and verify that classes have been reported and recorded. One new feature that the NCREC has recently implemented is to send an email to licensees once a school sponsor has reported the student’s completion of a course to the Commission. Make sure your contact information (including email address) is up-to-date with the NCREC. It is also important to save your certificates of completion from school sponsors in the event you need to show evidence of completion. If you did not complete your continuing education by the deadline, you should still go to Step 2 and renew your license. If you renew your license without completing all of your CE, your license status on July 1 will go to INACTIVE. There will be several steps you will need to take to reactivate, first of which is to make up your CE deficiency and complete the current year CE. Once that is done, you will be able to submit form 2.08 to reactivate your license. It is a bit more complicated if you are a Broker-in-Charge. If you find yourself CE deficient, I suggest you contact the NC Real Estate Commission at 919-875-3700. They can pull your license record and give you exact requirements and instructions for your particular situation. If you find yourself in this situation, check out our post on removing a NC real estate continuing education deficiency. Step 2. Renew Your NC Brokers License by June 30 on the NCREC website. Step 3. If you have a firm license, renew it online by June 30 on the NCREC website. Step 4. Pay your NC privilege tax. This bill should be mailed to you the first quarter of each year and is due by June 30. View the complete statute on the requirements for a professional to have a privilege license. In summary, the statute says every individual in NC who practices a profession or engages in a business and is included on the list must obtain a statewide license for the privilege of practicing the profession or engaging in the business from the Secretary. A license required by this section is not transferable to another person. The tax for each license is fifty dollars ($50.00) per year. If you need to apply for a privilege license or change your address, you can get those forms here on the NC Department of Revenue website. The NCDOR site states that privilege renewal fees can not be paid online. I hope this information proves helpful to NC real estate licensees and real estate firms.